Vascular Disease – Cardiovascular Associates, P.C. 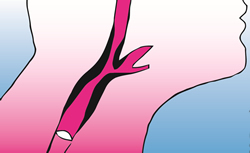 Aneurysms are balloon-like out-pouchings of the wall of the aorta. They can involve any portion of the aorta, but are most commonly located in the abdomen. Aneurysms are frequently asymptomatic but may cause back or abdominal pain. Often, pain is a sign of impending rupture of the aneurysm. As aneurysms enlarge, the chance of rupture increases proportionately. Another common location for blockage of the arteries is at the branching of the aorta into the two large arteries (iliac arteries) which supply the legs. This results in a symptom called claudication which is pain in the muscles of the hips, thighs or calves associated with exercise and relieved by rest. When there is involvement of the arteries to the brain with hardening of the arteries, patients may experience neurologic symptoms. Commonly, the arteries which divide in the neck are involved with blockages. Often, fragments of the cholesterol-plaque may dislodge and go to a part of the brain. This may result in a transient change in mental status associated with changes in speech or loss of strength or eyesight on one side. A transient change is referred to as a TIA or transient ischemic attack. If the damage is permanent, a stroke results. Peripheral arterial disease (PAD) affects about 8 million Americans and is associated with significant morbidity and mortality. A common location for blockage of the arteries is at the branching of the aorta into the two large arteries (iliac arteries), which supply blood to the legs. This results in a symptom called claudication which is pain in the muscles of the hips, thighs or calves associated with exercise and relieved by rest. A quick, painless vascular study can be done in the office setting to look for hardening of the artieries. Arterial vascular testing includes looking at the blood pressure in different segments of the legs and arms, and assessing the pulse waves using ultrasound.Â In addition, we sometimes produce images of the arteries to identify the location of blockages. PAD affects 12-20% of Americans ages 65 and older. Despite its prevalence and cardiovascular risk implications, only 25% of PAD patients are undergoing treatment. In the general population, only about 10% of persons with PAD have the classic symptoms of intermittent claudication. Chronic kidney disease (CKD), also known as chronic renal disease, is a progressive loss of renal function over a period of months or years. End stage renal disease (ESRD) is a severe illness and requires some form of renal replacement therapy (dialysis or renal transplant). 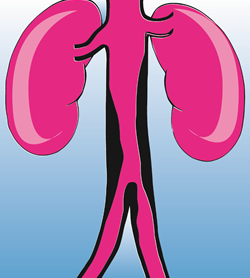 Some patients with kidney failure require dialysis, a procedure to remove waste products from the blood. There are two types of dialysis, peritoneal dialysis, where the patient does the process at home themself, and hemodialysis done at an outpatient center. To provide temporary access for hemodialysis, we may insert a catheter into one of the neck veins or in the vein under the collarbone. 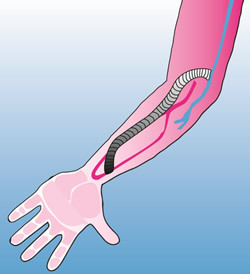 For permanent access, a graft is inserted connecting an artery to a vein. This may be placed in the arm or leg. From time to time, the graft may clot and require percutaneous interventions or surgery. For some patients there may be pain or numbness in the hand from the stealing of blood flow. If this occurs, tell your doctor. 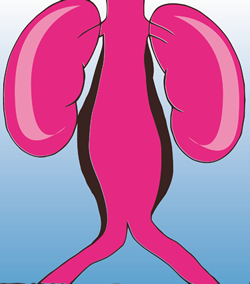 Many renal dialysis cases can now be performed in the office surgical suites. These procedures include catheter placement, exchange or removal, along with declotting a clotted access graft and performing angiograms (taking pictures of the arteries and veins) to assess any blood flow problems or areas of stenosis. These procedures are all done under minimal anesthetic allowing the patient a short office stay.